'For Miss Middleton', who suffers from retching (dyspepsia). Gives advice, including the recommendation to continue laudanum, but with glysters to combat the resulting costiveness, and two recipes. A land journey may be better than a sea-voyage. 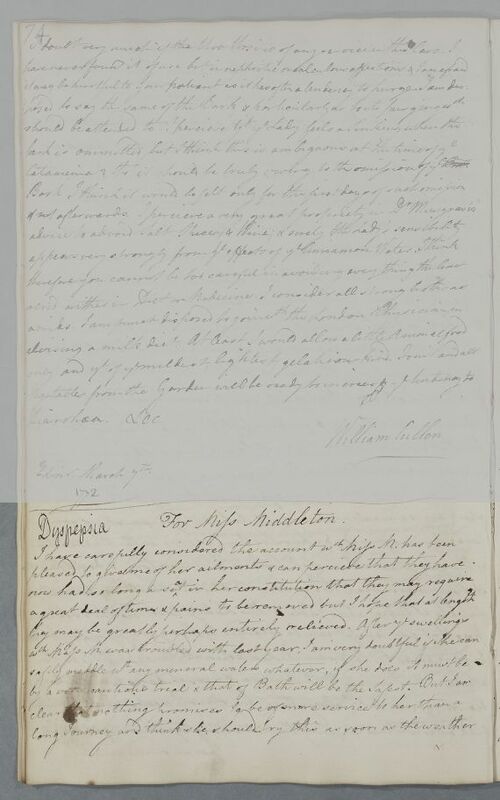 [DOC ID:1216] is a loose draft of this letter in Cullen's hand (it shows minor corrections and includes all of the closure). 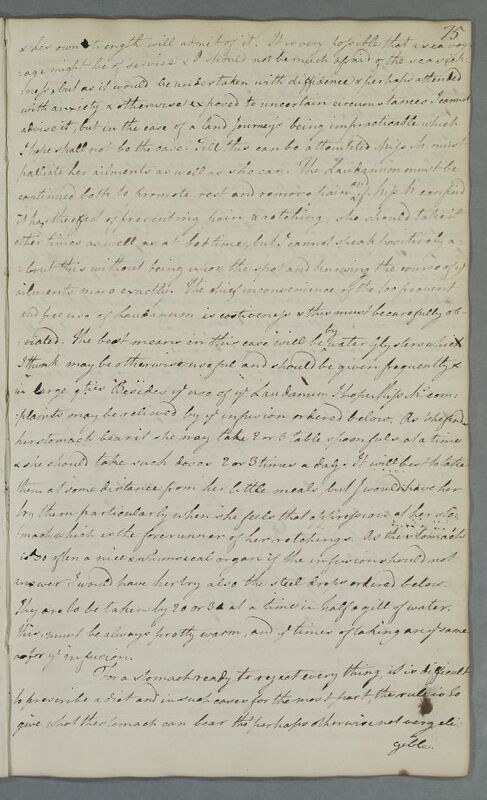 Summary 'For Miss Middleton', who suffers from retching (dyspepsia). Gives advice, including the recommendation to continue laudanum, but with glysters to combat the resulting costiveness, and two recipes. A land journey may be better than a sea-voyage. 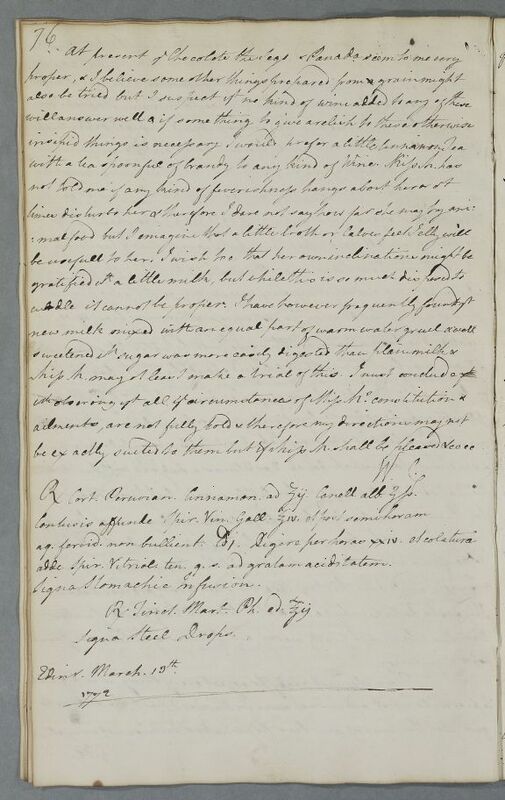 [DOC ID:1216] is a loose draft of this letter in Cullen's hand (it shows minor corrections and includes all of the closure). Case of Miss Middleton with a stomach complaint. answer I would have her try also the steel drops ordered below. They are to be taken by 20 or 30 at a time in half a gill of water. Take two drachms each of Peruvian Bark and Cinnamon, and half a drachm of White Cinnamon. Crush, and pour over four ounces of French Brandy, and half an hour later, a pint of hot but not boiling water. Steep for twenty-four hours and strain. Add enough thin Spirits of Vitriol for agreeable acidity. Label: Stomachic Infusion. Take two ounces of Tincture of Mars from the Edinburgh Pharmacœpia. Label: Steel Drops. ℞ Cort. Peruvian. Cinnamon @ ʒij Canell. alb. ʒſs. adde Spir. Vitriol. ten. q. s. ad gratam aciditatem.